The psalmist referred to a special dove having silver-covered wings, with feathers sporting yellow-gold highlights (literally, flight-feathers of greenish-gold). What a beautiful dove that must be! 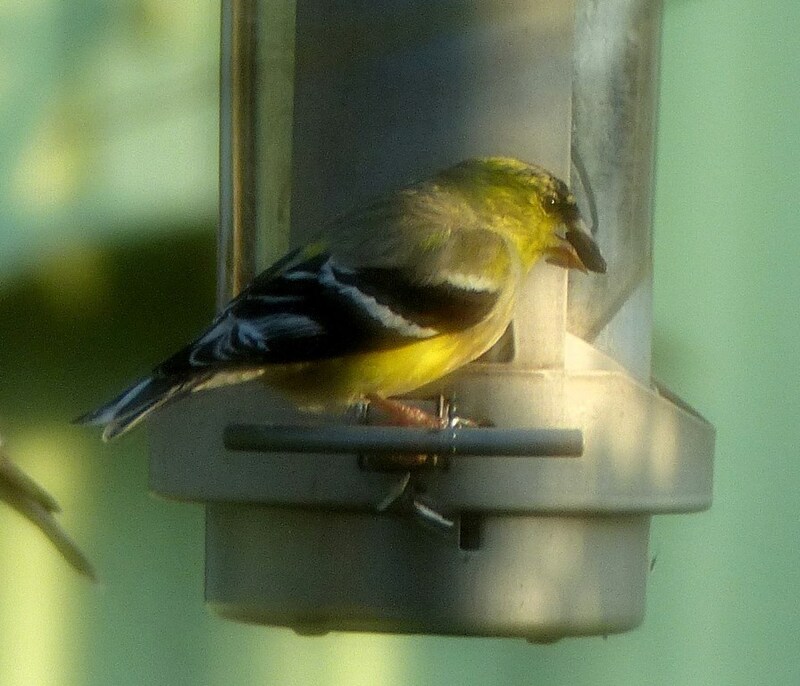 In America, however, there is a yellow-colored finch that we are more likely to see, the AMERICAN GOLDFINCH. 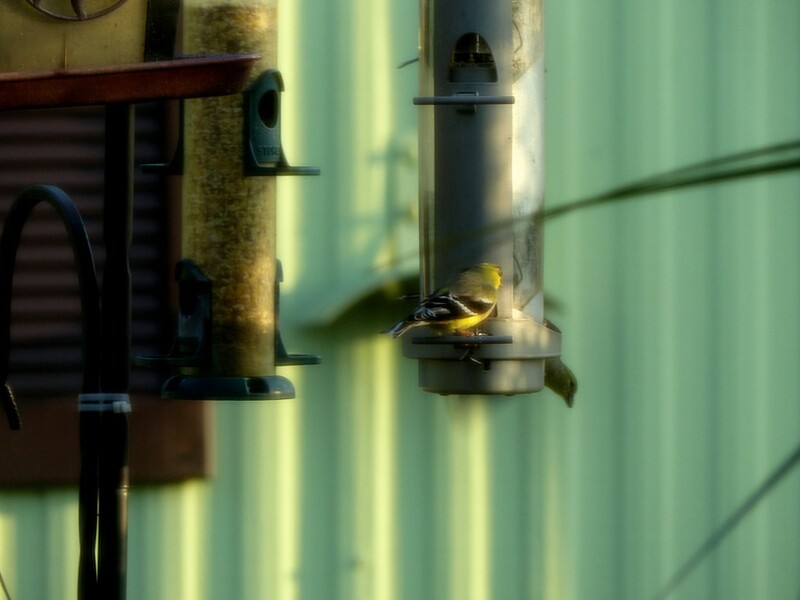 It too could be called greenish-gold, because its plumage varies seasonally, from lemon-yellow to a light olive-green. 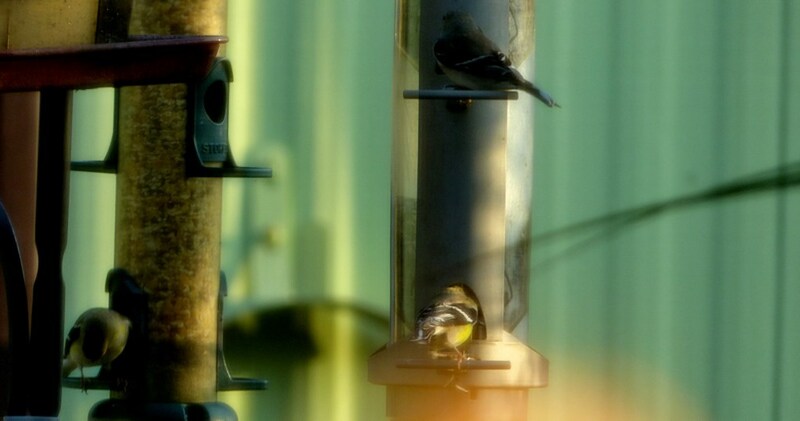 Goldfinches are small passerines, monogamous (i.e., male-female couples permanently paired, as if married) gregarious (i.e., they travels and feed in flocks), and they migrate to and form the outer territories of their populational ranges — although they are year-round residents in much of their American range (see Wikipedia range map below: yellow for breeding-only, green for year-round residence, blue for over-wintering only). 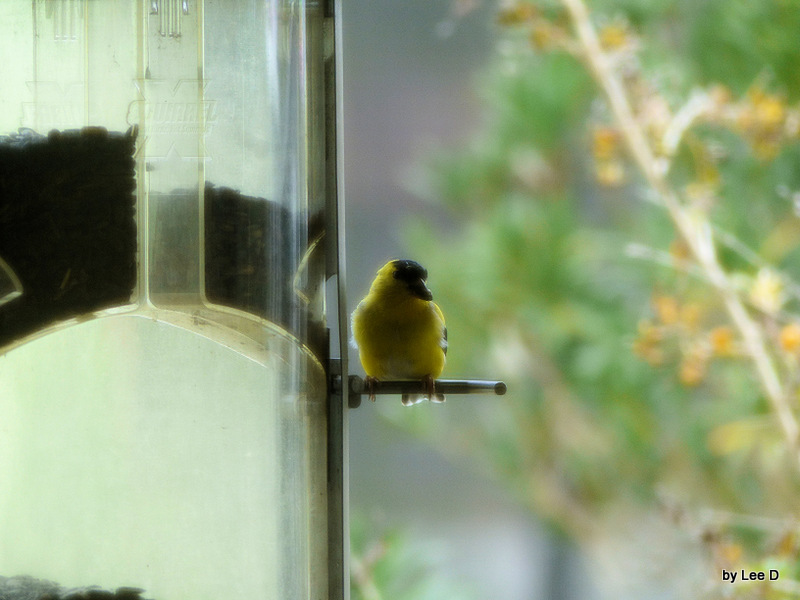 God provides for all goldfinch needs. One of Shakespeare’s plays, MACBETH, includes a cynical comment that compares the transitory experience of human mortality to a fleeting “hour upon the stage”, like a “tale” that is “told” with “sound and fury”, yet “signifying nothing” (MACBETH, Act 5, Scene 5). It is true that this earthly lifetime is transitory and fleeting (James 4:13-15), yet this earthly life is the opposite of meaningless — unless we foolishly ignore our Maker (Ecclesiastes 12:1). 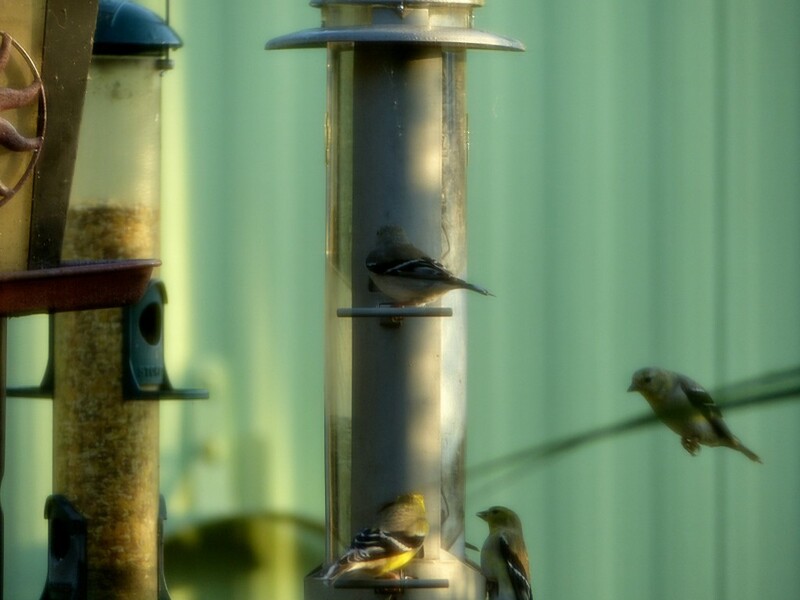 And our Maker cares so much for us — much more than He cares for little birds, like sparrows (Matthew 10:29-31), — so much that He has provided a free redemption and abundant life in Christ, available to all who believingly receive Him as personal Savior (John 1:12 & 3:16 & 14:6). And, thankfully, belonging to Him lasts forever! Time flies. Time zooms by even moreso when one is experiencing a wonderful blessing, as the above limerick briefly notes in fly-by fashion. Such a time was last Thursday (June 29th AD2017), when I was birdwatching (and butterfly-watching) with my youngest grandson, Hunter, at the Cox Arboretum in Dayton, Ohio. At the Arboretum we saw various birds (including English Sparrow [a/k/a “House Sparrow”], American Goldfinch, Canada Goose, Mallard, Robin, Northern Cardinal, and Chipping Sparrow), butterflies (including Cabbage White, Pipevine Swallowtail, Black Swallowtail, Spicebush Swallowtail, and Orange Sulphur), other insects (bumblebees, ants, dragonflies, etc. ), pond-dwelling fish, slow-moving turtles, and scampering chipmunks. For me, the Chipping Sparrow was a special highlight — it is a summer breeder during its migrant months in Ohio. (Hunter accurately described the Chipping Sparrow, who helpfully posed for our observations, as looking like an English Sparrow except “his head has red on it” and “there’s some white by his eyes”.) 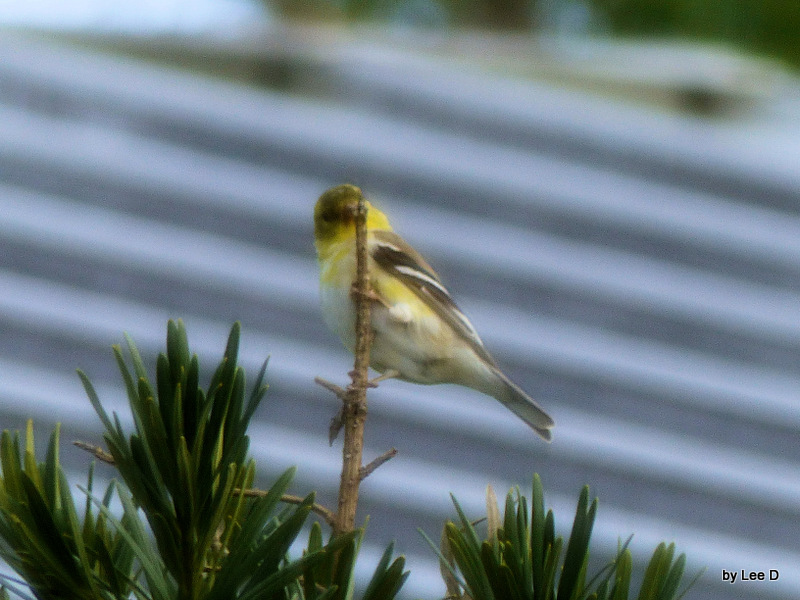 Hunter had a one-word comment on the American Goldfinch: WOW! The hours of hiking went all too quickly. It was a precious time for Farfar (Norwegian for “father’s father”) to teach a grandson something of the wonders of God’s creation, and something about the wonderfulness of God Himself. Thankfully, neither of us fell into any of the ponds — although some inspections of turtles or fish came close to a splashing scenario. It was a good day — albeit one that hurried by all too quickly. For the last two weeks, I have had to stay close to home. First, the disc in my back slipped a little more, causing great pain and lack of mobility. (The biggest slip was back in August) Then, after making it almost through the winter without bronchitis, it caught up with me. The pollen was so heavy, that it was necessary to just stay home to get things back in control. So, this was all mentioned for several reasons. 1) Prayers are always accepted. 2) I was able to work on my online course from the School of Biblical Apologetics. 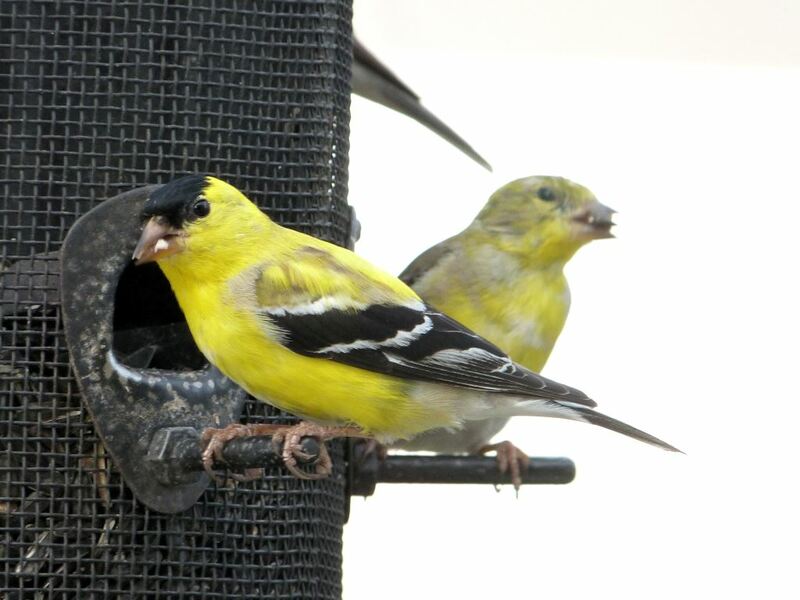 3) Best of all, the Lord kept sending Avian Wonders for me to watch and be reminded that He always cares for them and us. 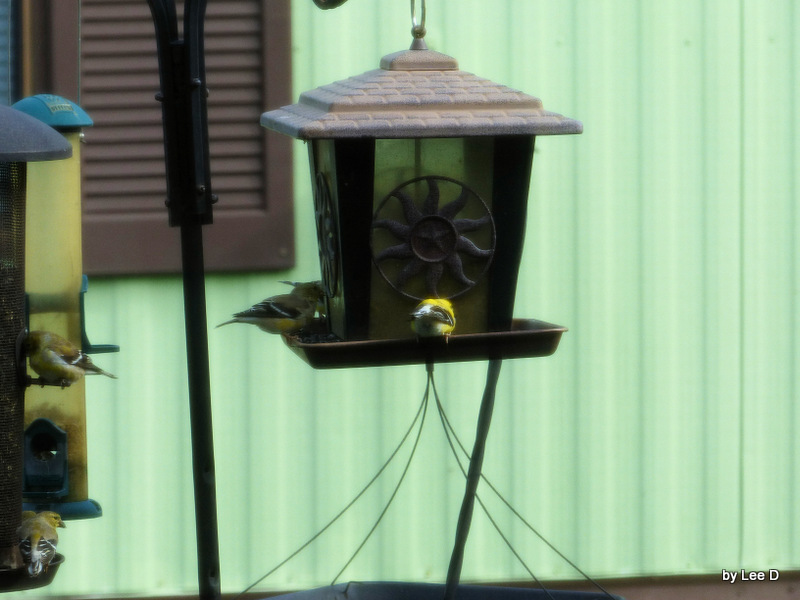 The most surprising was the American Goldfinches that started coming to my feeders. Very seldom do any come by to dine. Maybe one or two at most. 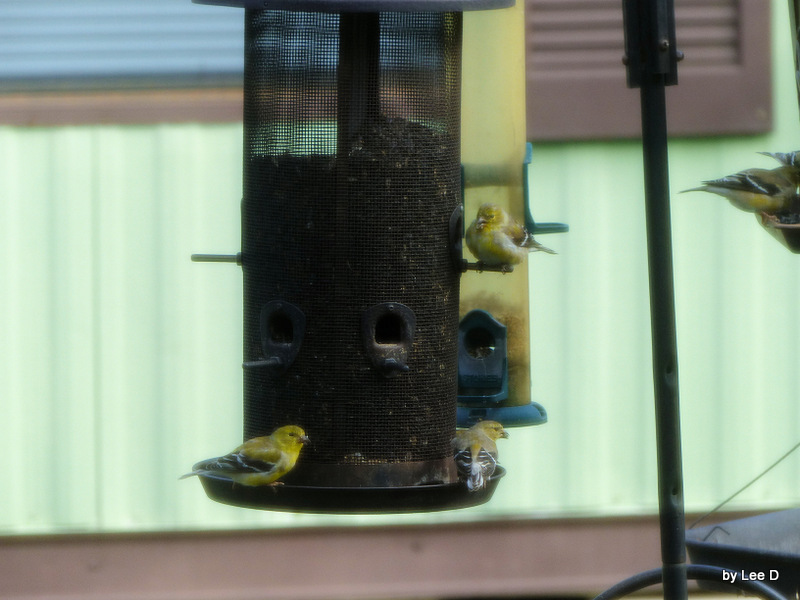 Several times over a week or so, we saw as many as 14 at one time. 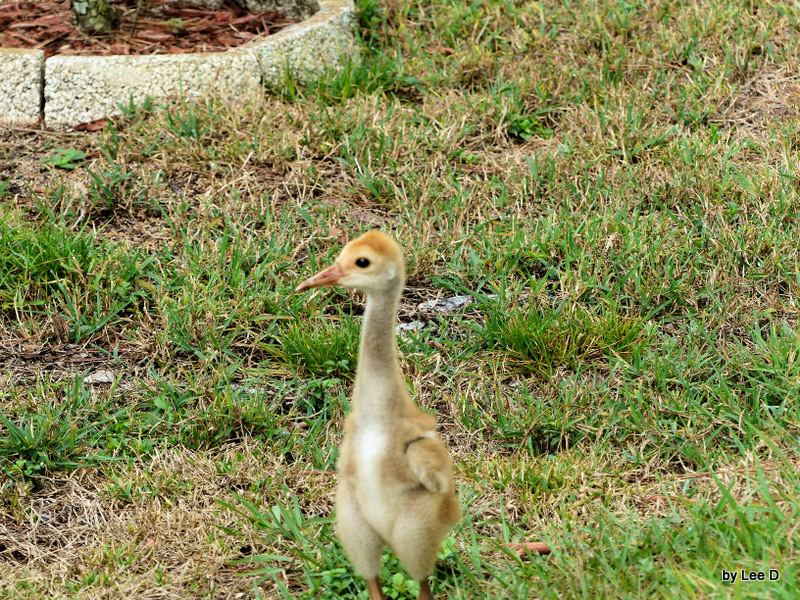 We figured that they were probably a small flock making their way north for the summer, and with the Lord’s help, landed here to rest and “tank-up” for the rest of their journey. They seem to have now continued their migration. 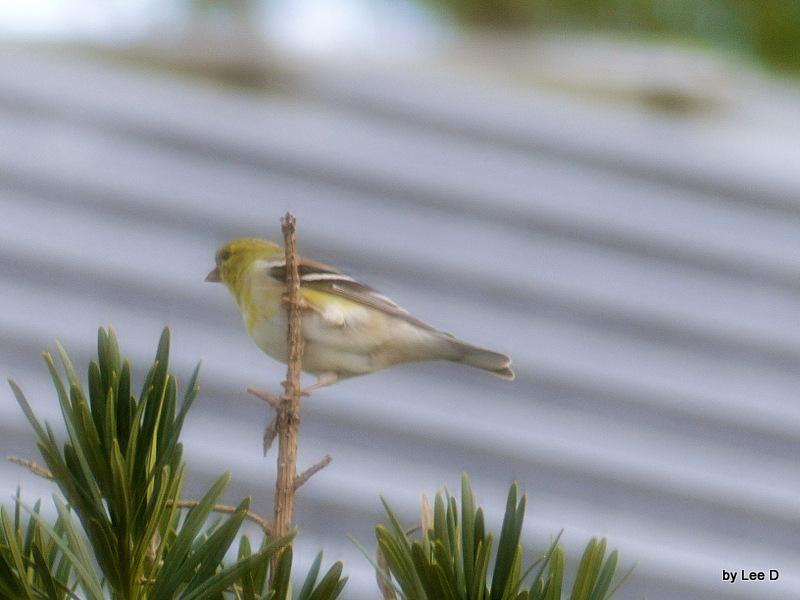 Haven’t seen but the one or two who come by occasionally for the last two days. (OOPS!!!) 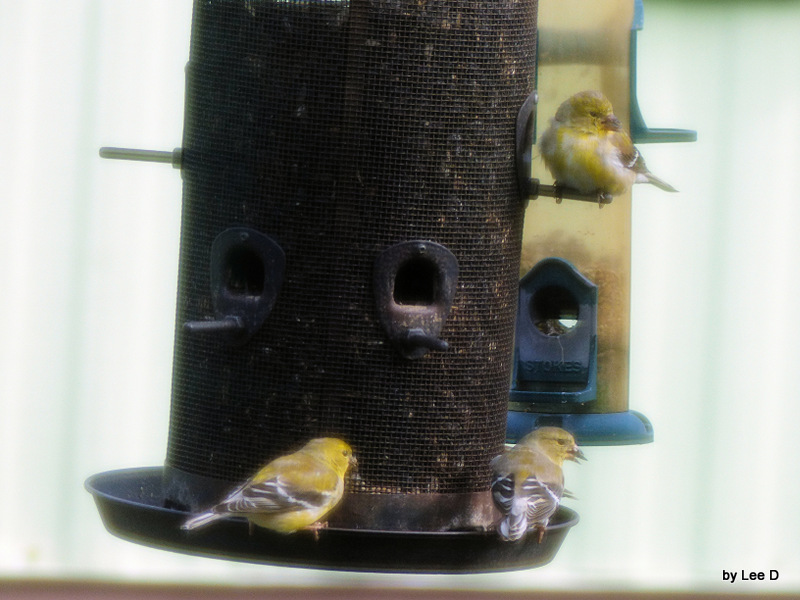 Just looked out the window while working on this article and now there are at least 10 of them out there feeding. YEAH!! 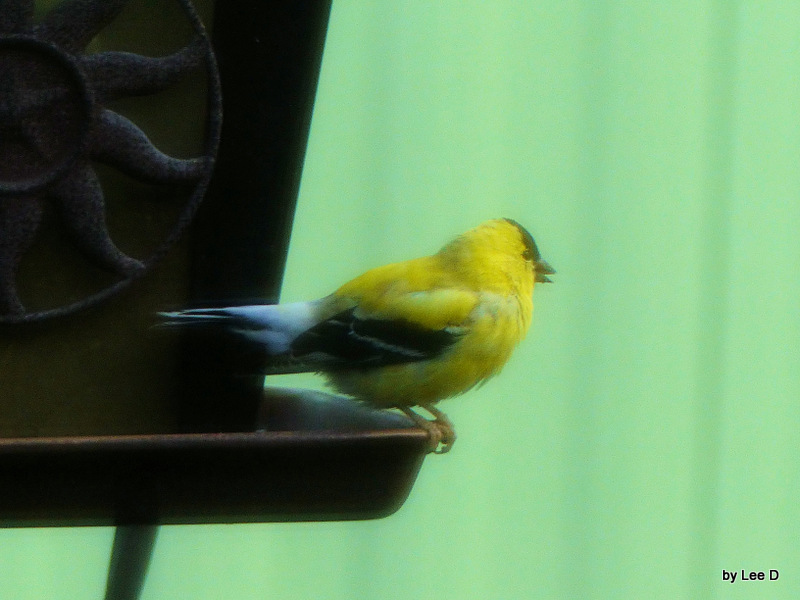 Here are some of the photos of them, unfortunately, photographed through a screened window. 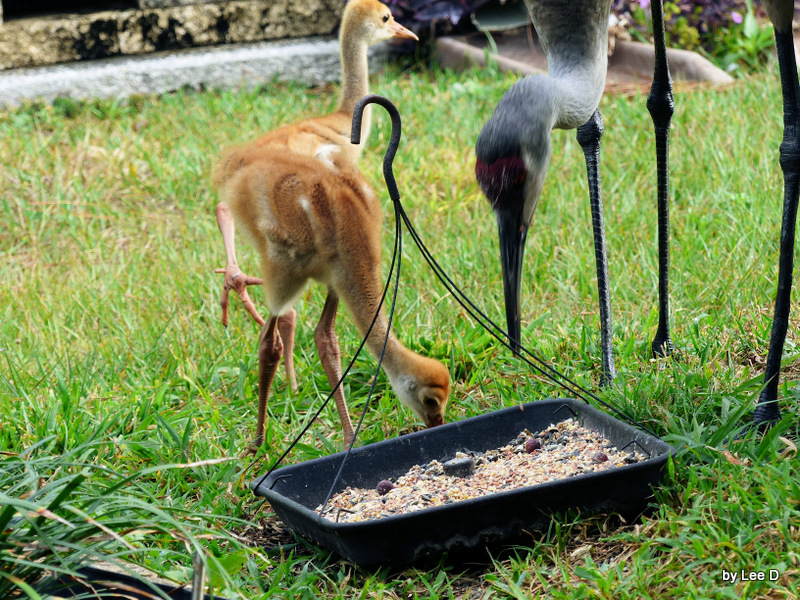 Then on Saturday, mom and pop Sandhill Crane came to the yard with their two new youngsters. This time, Dan was able to take the camera and get a few photos of them. Yesterday, Easter, we drove over to Tampa to the Bayside Community Church to hear Dr. James J. S. Johnson from the Institute for Creation Research speak. 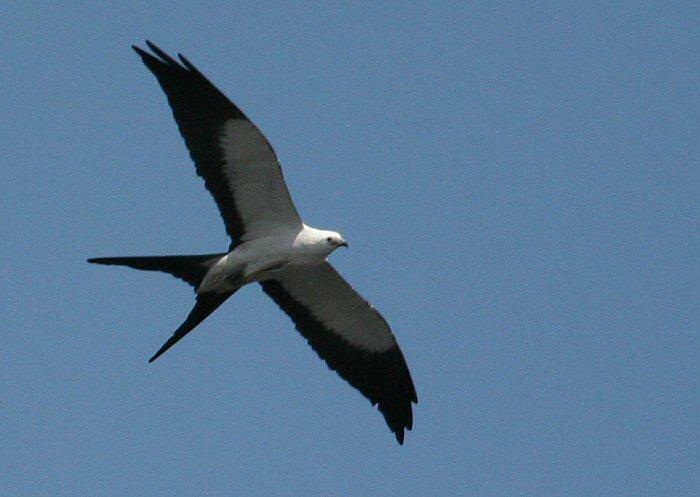 On the way over, we had two Swallow tailed Kites fly right over us. 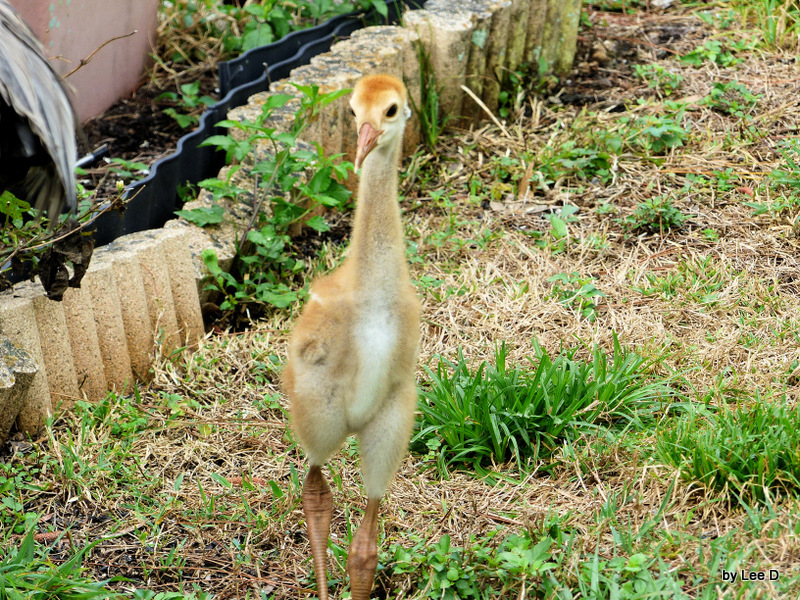 They migrate through here this time of the year. 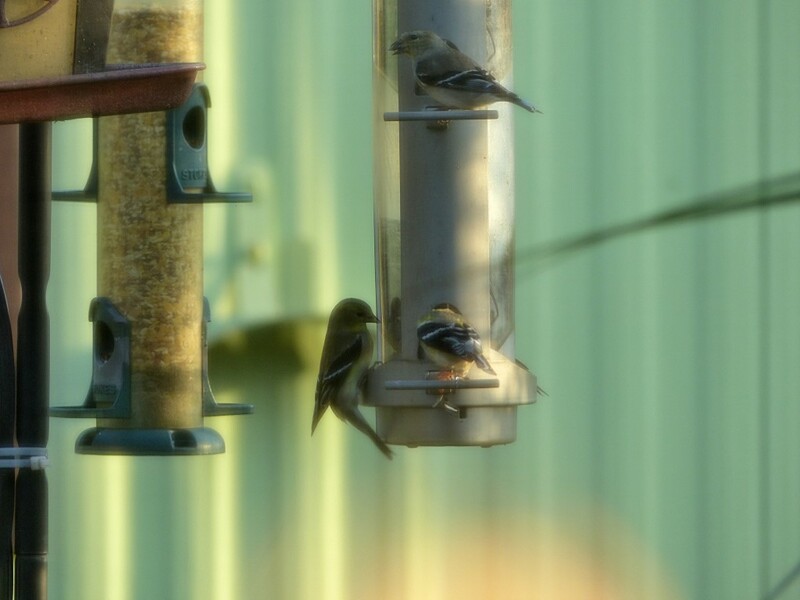 They seem to stay for about 2-3 months and then head on north. They are so beautiful to watch. 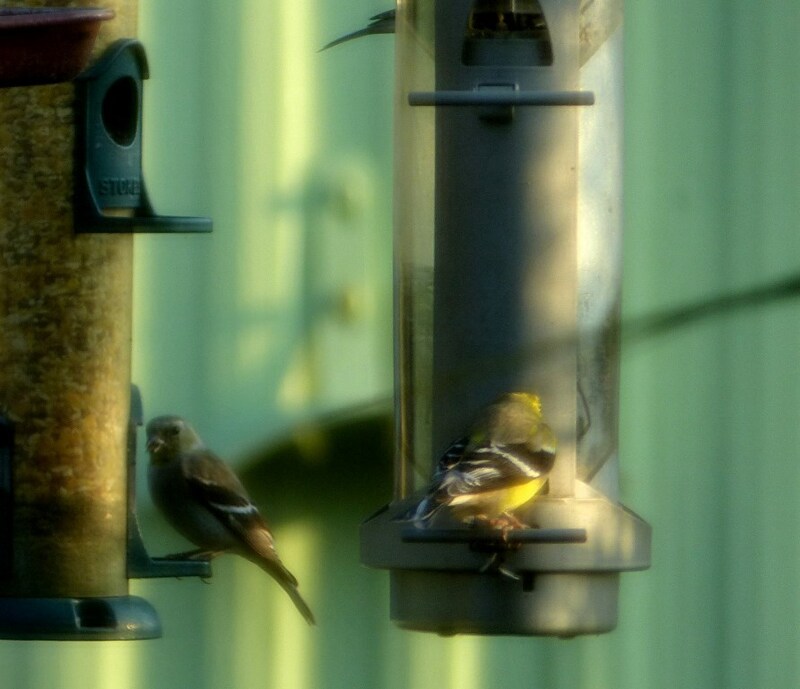 What a great surprise and blessing when I looked out the kitchen window this morning. 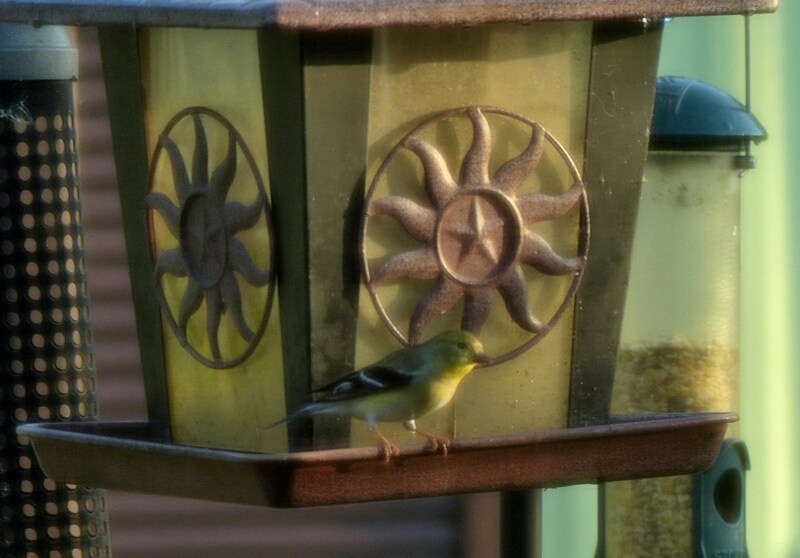 Spotted an American Goldfinch at my feeder. Haven’t seen any in months. So it was neat to watch them. 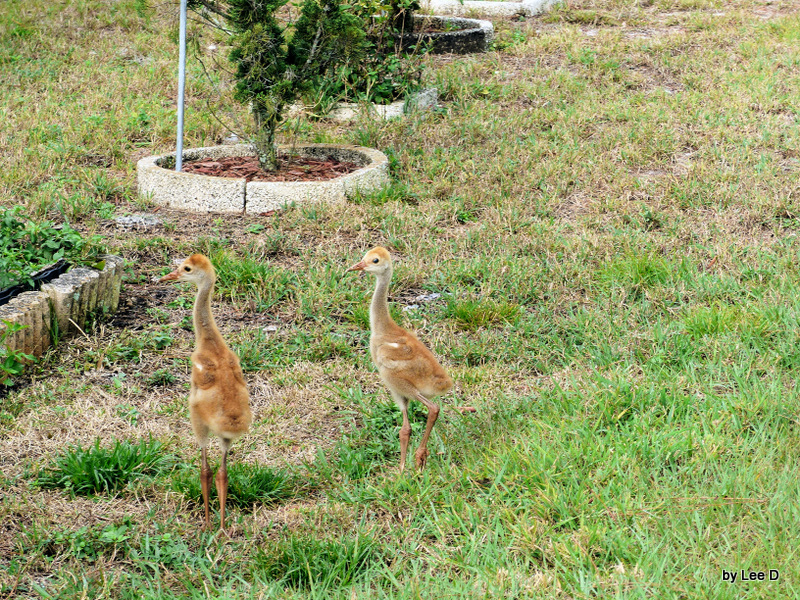 They kept coming and before long there were at least six. 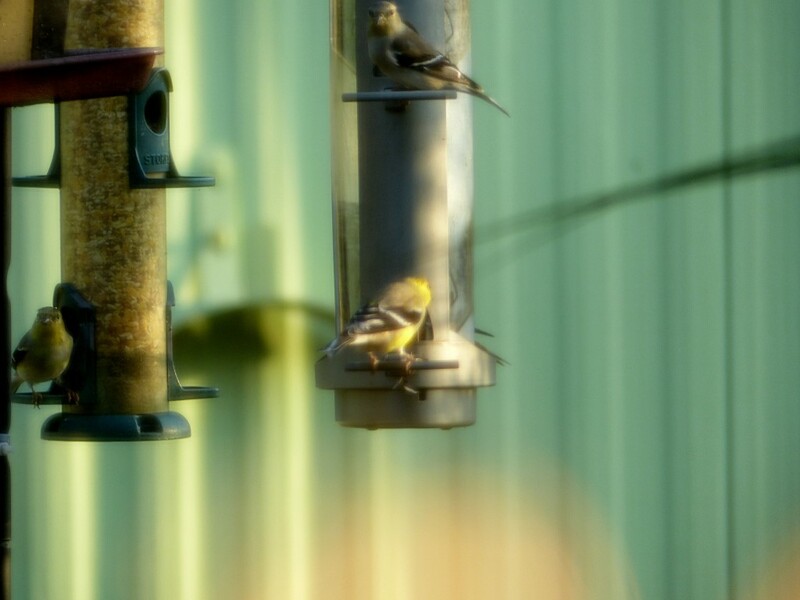 Went to get the camera when the first one showed up and recorded them as they kept coming in. 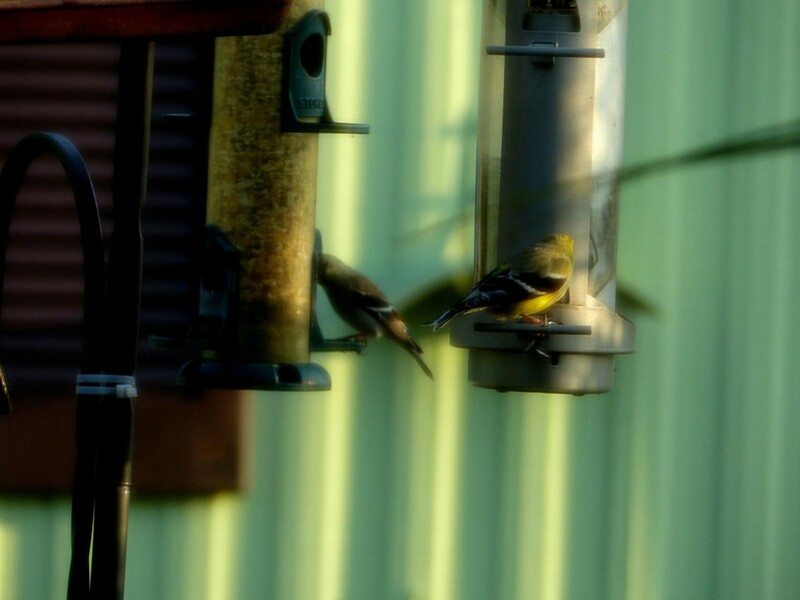 These photos are through the screen, so forgive the quality, but just wanted to share them with you. 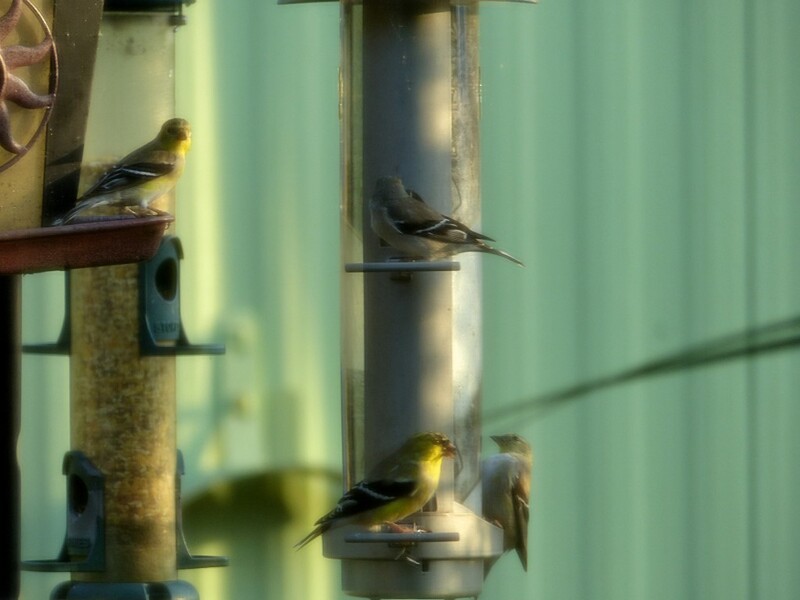 I have been battling another round of bronchitis, third one this winter, hence not many birdwatching adventures to report lately. They almost put me in hospital yesterday with possible pneumonia, because of a low oxygen reading. Because of this, I have not been to many of your sites lately to stop by. Your prayers are again appreciated and always welcome. 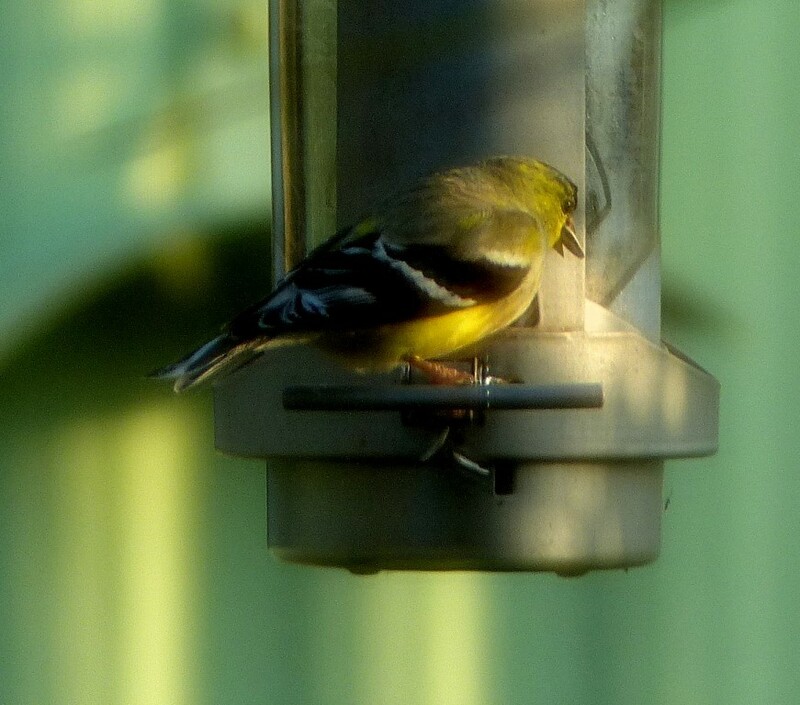 We have been having American Goldfinches at the feeders for the last few weeks. Don’t see them often, so was enjoying their presence. They kept building in numbers from 6 at first, then 12 about a week ago, then Easter Sunday there were at least 20 of them. 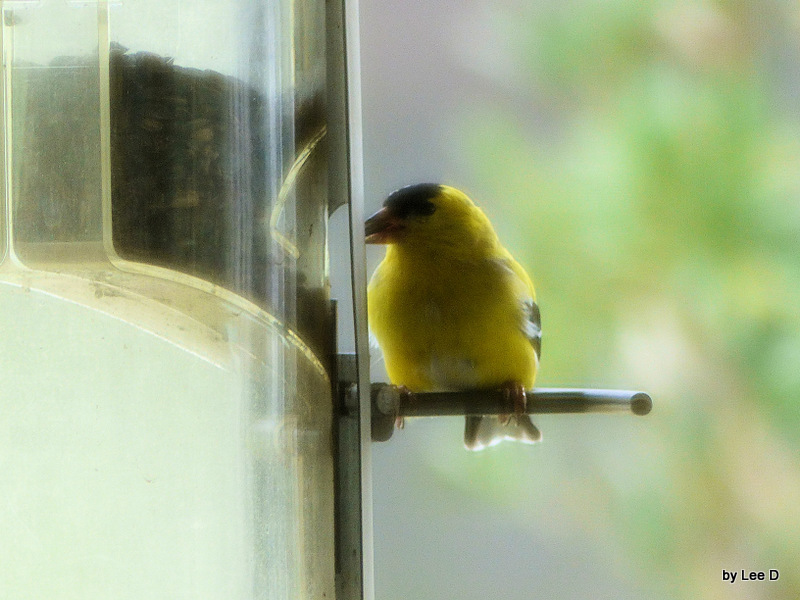 It even motivated me to wash the window and take out the screen on Monday to get better photos of them. 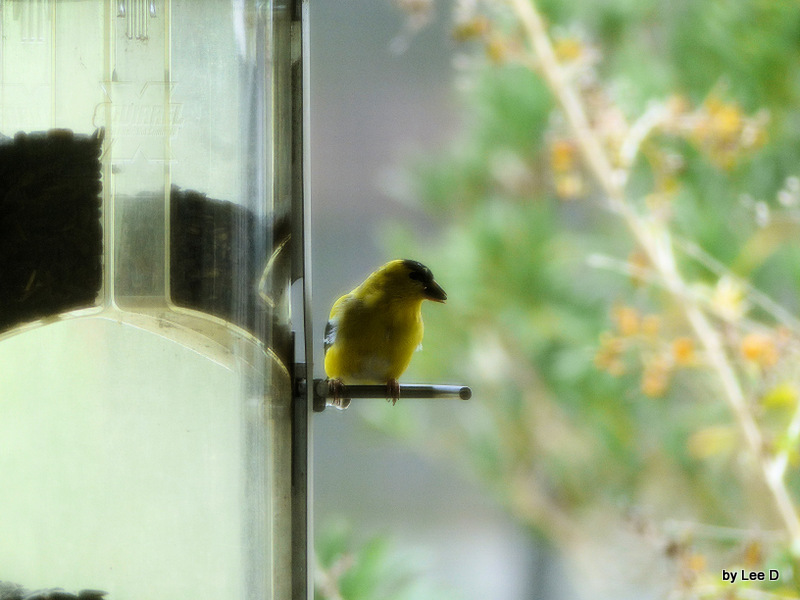 Yesterday morning, Wednesday, I checked out the window to see how many there were now. Not a one! So throughout the morning I kept checking, NONE! When we went out, there was no singing in the trees that we have been hearing lately. Needless to say, I was a little disappointed, but it didn’t take long to figure out where they were. GONE!!! 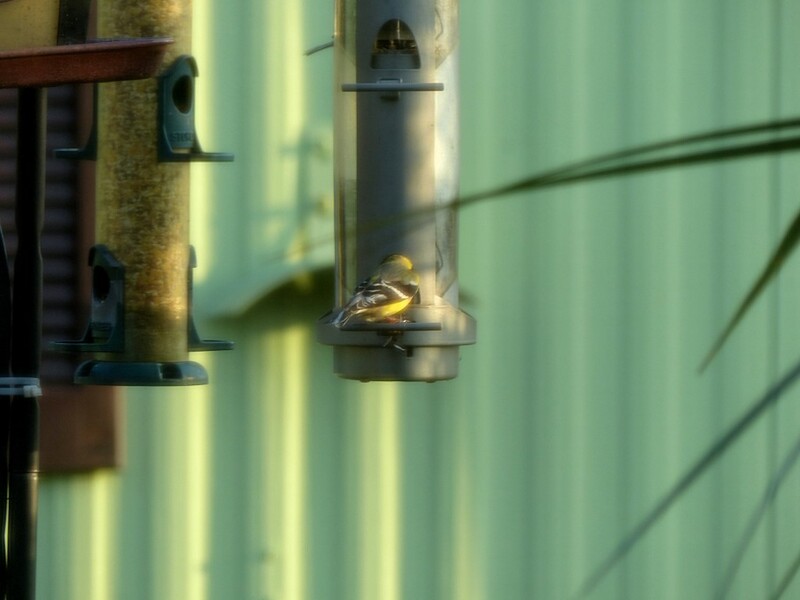 Keep your eyes open up north, the Goldfinches are on the way. This is a spring occurrence down here. 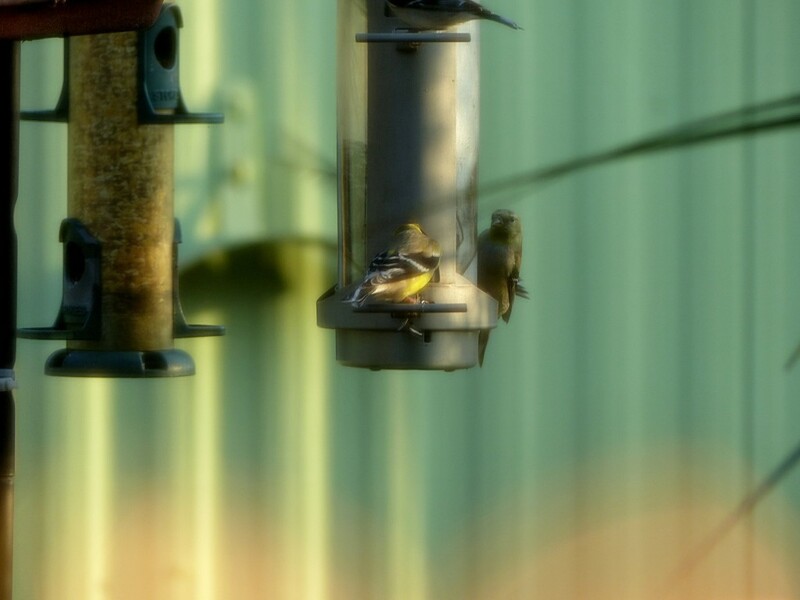 The birds fold up their lounge chairs, pack the bellies full of my sunflower seed and head back home. They have territories to claim, nest to build, broods to raise and give you now the pleasure of viewing them and listening to their songs. ENJOY! 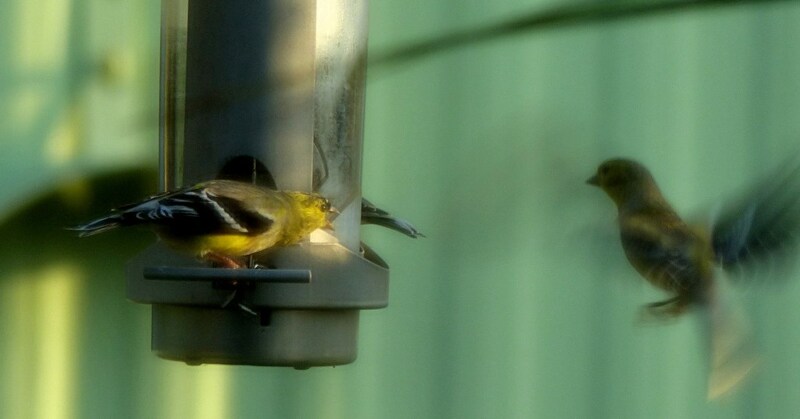 It’s your turn to enjoy the Lord’s beautiful American Goldfinches as they migrate up to you. Treat them nice and when fall comes, send them back, please.